Clean, isolated images have a charm have their own. They look beautiful on a slide and help you make your point without distracting the audience’s attention. But unfortunately, most photos come with unwanted backgrounds that make the picture look messy on the slide. Is there a way to clean up your pictures easily without having to use expensive graphic software like Photoshop? You can use a basic tool in PowerPoint to isolate your pictures like a pro, in a fraction of the time it takes to do the same job using any other fancy graphic software. In this article, I will show you how to do it in a step by step way. Right. Let’s jump right in. We want to retain just the table with the laptop for the purpose of this article. However, there are unwanted junk elements in the photo like the draws and the floor that distract the viewer’s attention. So, how do we get rid of those elements? You can copy the image below on to your PowerPoint, if you’d like to follow along. Go to Autoshapes menu in the Home tab of PowerPoint ribbon. Under the ‘Lines’ option – click on the tool called ‘Freeform’ tool. The tool allows you to draw any shape you want by just clicking along the corners. With PowerPoint you can’t erase unwanted portions of a photo (like in Photoshop or any other high end graphic software). What you saw is just a small sample of the hidden capabilities of PowerPoint. In fact, once you learn how to work with PowerPoint well, you would never want to go back to Photoshop for most of your design tasks, because you can get better results, faster using just PowerPoint. 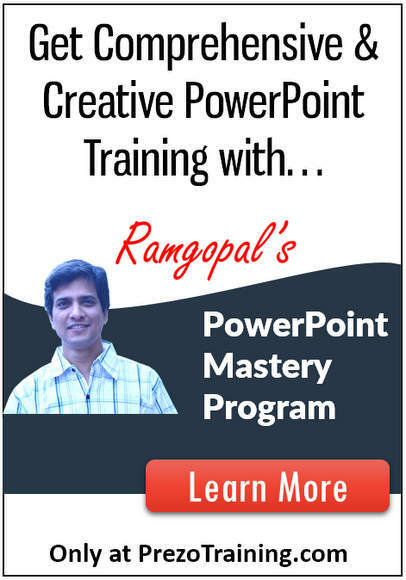 If you are truly interested in improving your PowerPoint skills, so you can get professional looking slides that get you business results – I highly recommend you take a look at our ‘Ramgopal’s PowerPoint Mastery Program’. It is the most comprehensive and creative PowerPoint training online for business presenters. In fact, Ramgopal’s PowerPoint Mastery is the only program you’ll need to take your business PowerPoint slides from Good to Great in the shortest possible time.